SAN DIEGO — All things considered, it was probably the worst game that the Phillies have played all season. With a victory Sunday, the Phillies would have headed home with a .500 record on this six-game West Coast swing. They would have maintained their lead in the National League East. And they would have won their 66th game, matching their total from all of last season in 45 fewer games. But none of that happened. Instead, the Phillies played substandard defense, blundered on the bases with a five-run deficit in the fifth inning, got two hits through the first seven innings and and were humbled, 9-3 by the San Diego Padres, on a grand slam by Freddy Galvis, the light-hitting shortstop whom they traded away in the offseason. And so, the Phillies slipped back into a first-place tie with the Atlanta Braves, who edged the Milwaukee Brewers on Sunday. They completed the road trip with a 2-4 record after dropping two of three games to both the Arizona Diamondbacks and the Padres and flew home to face the best-in-the-majors Boston Red Sox on Tuesday night at Citizens Bank Park. There’s no shame in losing a series on the road to the playoff-caliber Diamondbacks, but the Padres possess the worst record in the National League. They also are the third non-contending team to take a series from the visiting Phillies within the last month. The Phils lost two of three games in Miami on July 13-15 and three out of four in Cincinnati on July 26-29. And then there was the way the Phillies lost on Sunday. 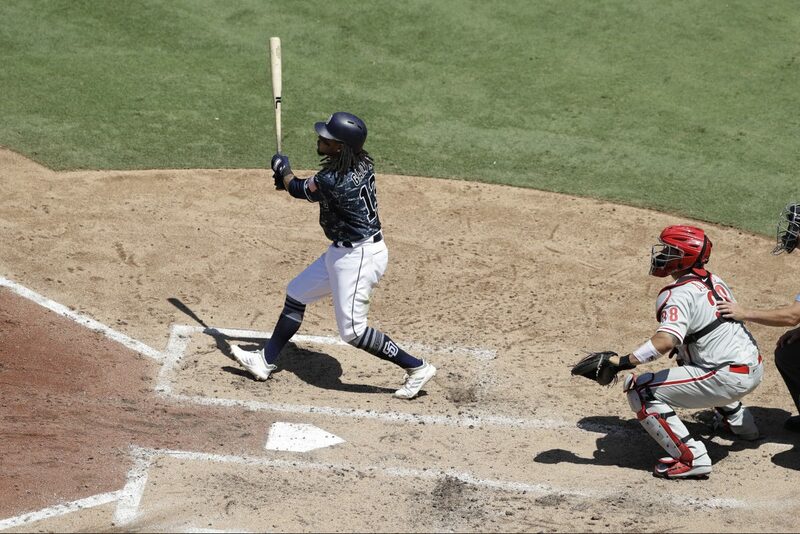 They were charged with two errors, a throw by third baseman Maikel Franco that sailed wide of home plate and enabled Travis Jankowski to score the Padres’ sixth run of the game in the seventh inning and a misfired throw to first base by reliever Austin Davis that allowed another run to score in the eighth. But they failed to make a handful of other plays in a manner consistent with their minus-73 defensive runs saved, the third-worst mark in the majors. None was more costly than Eric Hosmer’s 35-foot tapper between home plate and the mound in the third inning. Catcher Jorge Alfaro and pitcher Jake Arrieta both went after the ball, but neither took charge, allowing Hosmer to reach base. Arrieta retired the next two batters but issued a two-out walk to Austin Hedges to load the bases. He got ahead of Galvis before throwing a sinker in a 2-2 count that Galvis cranked for his first career grand slam. The Phillies traded Galvis, a slick-fielding shortstop who tends to roll over too many ground balls to fit their offensive style, for pitching prospect Enyel De Los Santos. And although Galvis is having another substandard offensive season (he entered play Sunday with a .641 OPS), he was 10-for-22 with nine RBIs in six games against the Phillies this season. It was 5-0 when Franco got thrown out at second base trying to stretch a double in the fifth inning. And it was 6-0 in the eighth when the Phillies’ offense really awoke. Back-to-back walks to Andrew Knapp and Cesar Hernandez and consecutive doubles by Nick Williams and Carlos Santana keyed a three-run rally that halved the deficit. But the Padres scored three times in the bottom of the eighth. Phillies manager Gabe Kapler isn’t fond of suggestions that losing series to bad teams is any more damaging that failing to beat winning clubs. But with the Red Sox bringing baseball’s best record (84-34) to Citizens Bank Park this week, the Phillies might regret not taking advantage of the Padres when they had the chance.